Among the daily tasks of transport companies are order management, customer management, driver and personnel management, equipment management, dispatch management, transport routing, loading order, administrative work, and so on. It is now possible to implement a Transportation Management Software that supports all these components. JFleet software allows you a comprehensive view of your operations and their evolution while being perfectly suited to your corporate methodology! The staff in charge of operations of any transport business must constantly adapt to changes. It is essential to provide dispatchers with tools that allow them to anticipate and plan their routes effectively and efficiently. Dispatchers must assign the right commodities to the right drivers while minimizing the loss of time, space, and gasoline. JFleet offers tools for approving decisions and supporting dispatchers in their task of assigning orders. 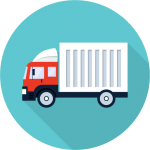 JFleet features fit in with all road transport operations: full loads (TL), partial loads (LTL), or the management of import and export containers (Intermodal). The goal is always to make each trip as profitable as possible. The application minimizes superfluous actions while delivering the goods more quickly. JFleet offers transport companies the chance to intelligently automate their operations in a simplified way!